By FFWPU Australia, October 4, 2015: The year was 1965, the Vietnam War was hitting up, the anti-war and the new age movement was gaining momentum, Martin Luther King Jr. lead the freedom marches from Selma to Montgomery Alabama. Sir Robert Menzies was the Prime Minister of Australia. On October 4, 1965 Pope Paul VI, the first Pope to visit America arrives in New York, and a petite young American woman Alexa Blonner, a former Catholic, arrived in Sydney, Australia, as the first Unificationist missionary. What different experiences: the Pope arrived to adulation and crowds while Alexa arrived as God’s representative on the Labour Day holiday with all shops closed and a very quiet Sydney. 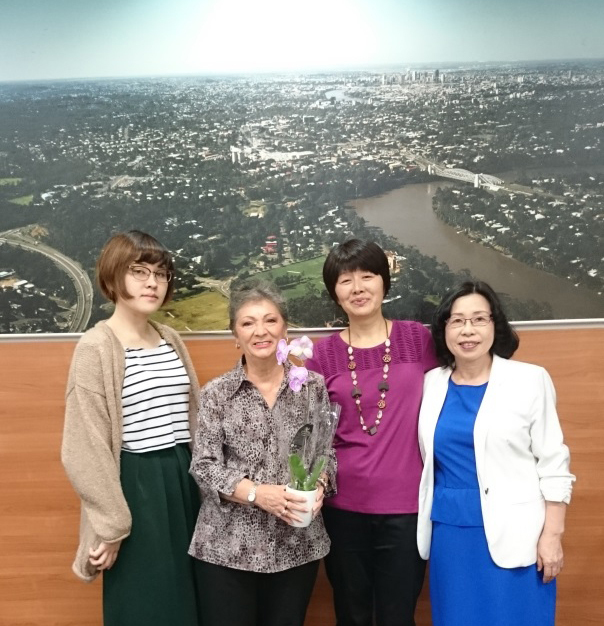 Fifty years later, a small gathering of Unificationist members met for Sunday service in Brisbane and recognized the faith and courage of this young woman. Alexa shared some of her early experiences in witnessing at that time. They were challenging to say the least and we could only imagine what it may have been like as the only Unificationist in Australia, without the support of other members (no internet in those days and unreliable and expensive international phone system). Those present gratefully recognized the foundation that has been laid by Alexa and the many others who have been inspired by Heavenly Parents and True Parents to go out into the world to teach the Principle and bear witness to God’s hope. This work continues and is being advanced under the parental guidance of True Parents in the form of Vision 2020.